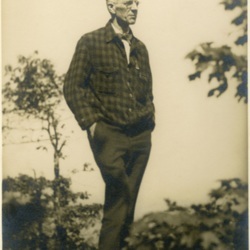 An overview of the history of the Appalachian Trail from its earliest beginnings as an idea hatched by Benton MacKaye to the present trail that stretches from Georgia to Maine, passing through 14 states and over approximately 2,190 miles. The Trail, which began its life in 1922 with the first sections blazed in New York state, was originally a project of volunteer trail clubs. In 1968 the AT was designated as a National Scenic Trail and thus became part of the National Park system. Today, more than 3 million people each year set foot on the Trail for a few hours, a few days, or to hike from one end to the other--a trip of around 5 million steps. This exhibit provides a brief summary of how a crazy idea first proposed in 1921, turned into America's most iconic hiking trail. More than 250 shelters line the Appalachian Trail from Springer Mountain in Georgia to Mount Katahdin in Maine. The oldest of these shelters date from the 1930s, while the most recent have been built in the past decade. They vary in construction and design from simple Adirondack style lean-tos made of logs cut and peeled in the nearby forest, to more elaborate structures with more than one story, or a front porch, or other novel features. 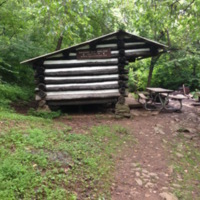 Like the Trail itself, these shelters are maintained by the network of volunteer clubs responsible for the upkeep of the Trail. They are intended for use by long distance hikers, but are open to all hikers seeking shelter along the Trail. Almost all are located close to a consistent water source and almost all have their own privy.